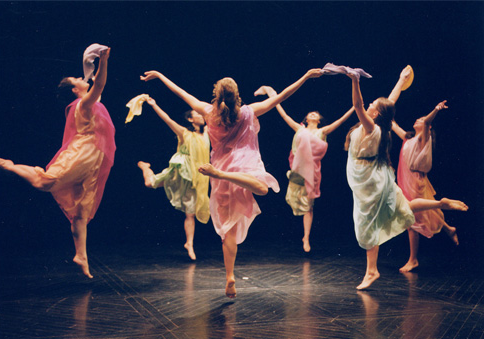 SAN FRANCISCO — Mary Sano and her Duncan Dancers will present the 17th annual Dionysian Festival, celebrating the 137th anniversary of Isadora Duncan’s birth, will be held Saturday, May 24, at 8 p.m. and Sunday, May 25, at 5 p.m. at the Mary Sano Studio of Duncan Dancing, 245 Fifth St., Studio 314, San Francisco (at Tehama between Howard and Folsom). Mary Sano and her Duncan Dancers in 2000. The Mary Sano Studio of Duncan Dancing, which opened in 1997, is dedicated to the preservation and promulgation of Isadora Duncan’s art, and to exploring its contemporary relevance through ongoing new work. Classical pianist Mutsuko Dohi is returning this year. Mary Sano and her Duncan Dancers will perform traditional Duncan repertoire to the music of Brahms and Gluck, accompanied by Dohi and flutist Elizabeth Gaston. Gaston is a specialist in classical wooden flute. Sano will premiere new choreography to the solo flute as well as music by Reynaldo Hahn for flute and piano. This occasion marks the first collaboration between Sano, Gaston, and Dohi. Special guests for this year’s festival are composer/neo classical pianist Benjamin Akeala Belew from Santa Clara and returning singer/songwriter Tony Chapman from Los Angeles. Both up-and-coming artists will play their original songs as well as playing and premiering new work with Mary Sano and her Duncan Dancers. Tickets are $20 at the door, $18 in advance. For more information, call (415) 357-1817, email [email protected] or visit www.duncandance.org. Thanks a lot for having chosen some works of Reynaldo Hahn, you can discover the fabulous world Reynaldo and his Belle Epoque on the web site and the Facebook page of the Reynaldo Hahn association. If you want any help or more detailed information about the works of Reynaldo Hahn, please feel free to contact us, it will be a pleasure for us to help you.